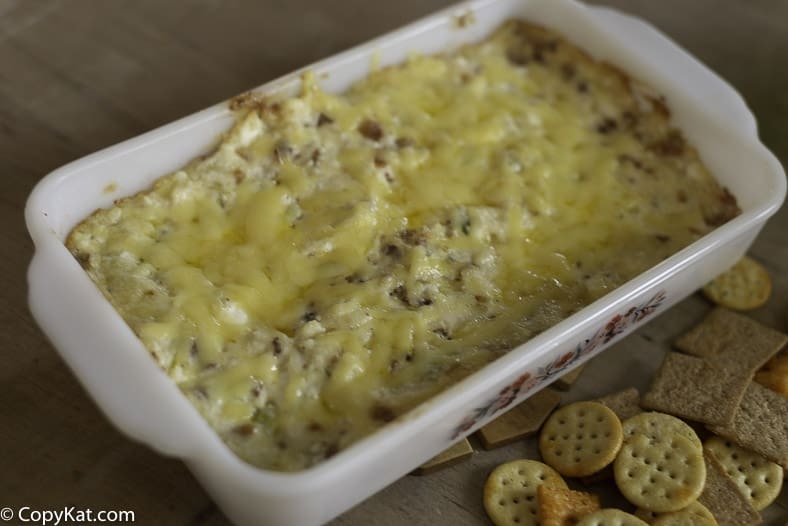 Hot Swiss and Bacon Dip is a delicious addition to a party or gathering. If you are on a low carb diet, this recipe is perfect for you! It’s only going to take you a couple of minutes to whip up this delightful dip, then comes the hard part, waiting for it to brown and get bubbly in the oven! Homemade dips are the best. This Hot Swiss and Bacon dip is perfect for those who are trying to watch their carbs. This dip is oh so easy to make. 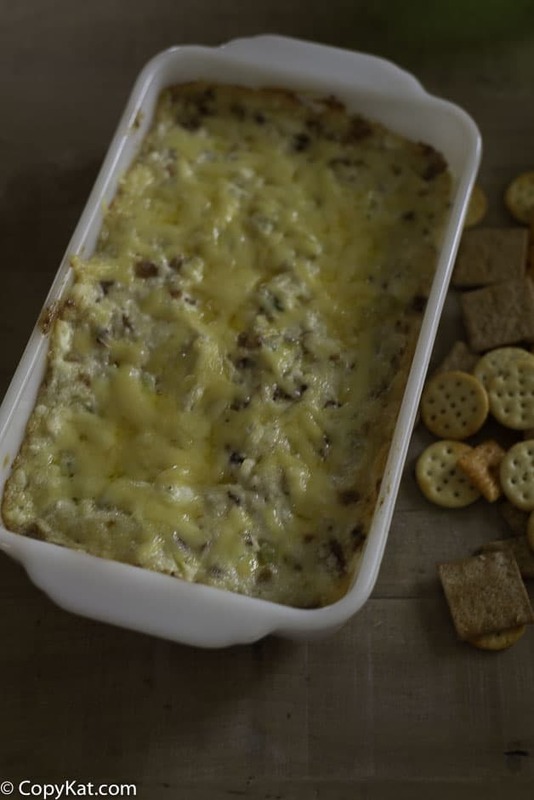 What makes Swiss and Bacon Dip so amazing? The smoke of the bacon and the nuttiness of the Swiss cheese is a marriage of flavor. The two flavors combine together oh so well. This dip is also oh so creamy, is it is the perfect dunkable and spreadable dip! This dip is also served hot so it is super easy to make, and when serving hot this dish simply one savory creation everyone will love. When served warm this dip is creamy and very spreadable. It goes well with crackers. Sometimes I like to make up a batch of my party cracker mix and serve it with those lovely seasoned crackers. If you have some Swiss and Bacon Dip left over, the dip is great warmed up and serve with bagels in the morning. Before this comes to your table being toasted to a browned creamy perfection, you may wonder how to cook bacon for this recipe. I highly suggest that you try my recipe for How to Bake Bacon. When you bake bacon you remove the chore of cooking bacon, as in the oven there is no mess. Cooking bacon in the oven means your stovetop stays clean, you can cook a whole package of bacon perfectly crisp at once, and you can save that flavorful bacon dip. Can’t get enough of homemade savory dips? Try some of these great dips. 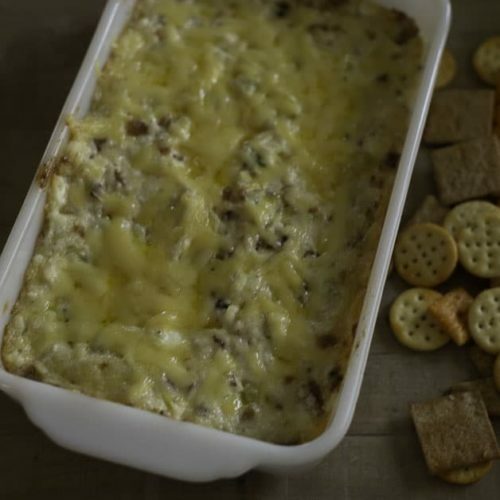 This Swiss cheese and bacon dip goes so well with crackers, it's a perfect party good. Mix all ingredients together except of the garnishing cheese and almonds. Put in shallow baking dish and sprinkle on extra Swiss cheese. Bake at 375 for 12-15 minutes or until dip is golden brown and all ingredients are melted together. Sprinkle on the smoked almonds. Serve with assorted vegetables, crackers and bread. This was really good! It went really fast I should have made more. I also go several request to the recipe! I will be making it again.